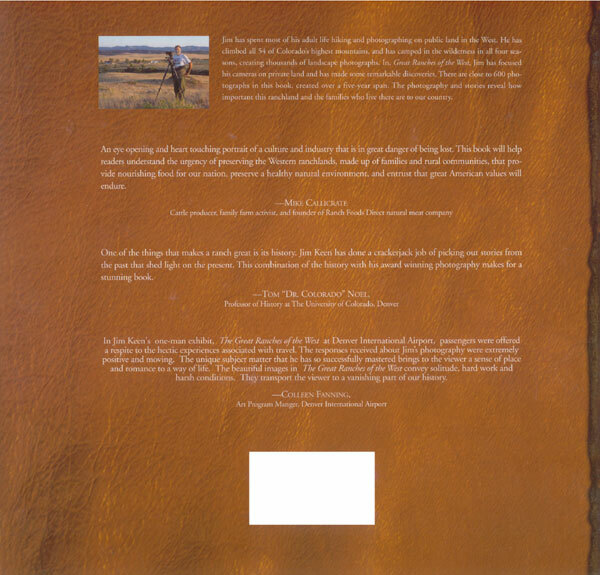 Great Ranches of the West is the culmination of a five year project. Comprised of nearly 600 stunning color photographs, this book covers the history and the people of thirty ranches throughout the Western states. Jim has done a wonderful job with this book, capturing Western ranch life in all its dimensions. "An eye opening and heart touching portrait of a culture and industry that is in great danger of being lost. This book will help readers understand the urgency of preserving the Western ranchlands, made up of families and rural communities, that provide nourishing food for our nation, preserve a healthy natural environment, and entrust that great American values will endure." "One of the things that makes a ranch great is its history. Jim Keen has done a crackerjack job of picking out stories from the past that shed light on the present. The combination of the history with his award winning photography makes for a stunning book." "The beautiful images in The Great Ranches of the West convey solitude, hard work and harsh conditions. They transport the viewer to a vanishing part of our history." You can Read a Sample Chapter of the book Free of Charge (796Kb, Requires Adobe Reader). This book was printed in Canada on high quality gloss stock at the specific request of the author, who refused to let it be printed overseas. True to the code, Mr. Keen's principles are not for sale, and we appreciate that dimension of his work as well.